Works of art can be designed to be installed practically anywhere, but one under used area is the ground we walk on. ArtCritiqued.com has tracked down a selection of artists making work both for and with floor surfaces that could be used by the dedicated collector, if you wished, to cover that last remaining blank space in your home. Carlos Noronha Feio has designed a series of Arraiolos carpets, which depict images of modern technology that may be used in war such as jet fighter planes, tanks, rockets and satellites, although they can also have many other peaceful technological and exploratory functions. This is highly political work, like the doormat-size carpet seen in the window of a Mayfair carpet dealers depicting a United States Five Dollar Bill across its entire width, which offers conflicting potential views of American patronism and luxury, versas walking over a past president and abandoning capitalism or commercialism. 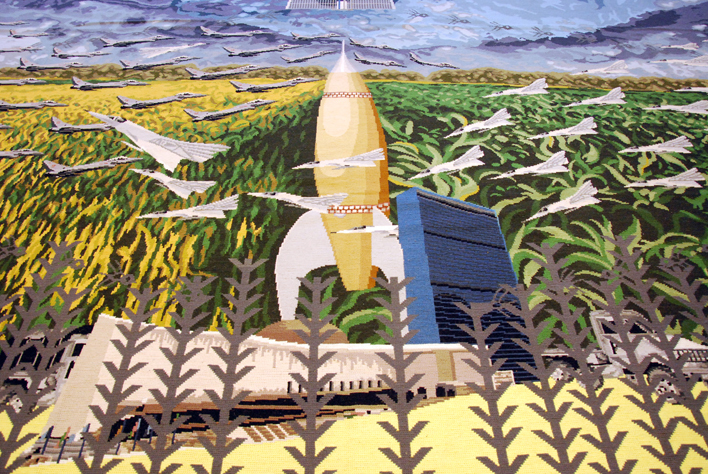 In Feio’s work the blood shed by those on the front line, along with civilian casualties in situations such as the dropping of the atomic bomb in Hiroshima, is interwoven with that of the carpet makers, whilst Feio seemingly keeps his hands clean in designing the piece like a political or military leader. This work consequently seems to question the reason for the existence and production of the depicted things, as the ownership of nuclear defence weapons seems questionable when no one would want to use them, and hence the work also addresses man as his own worst enemy. These pieces have the feel of the tapestries worked up from Raphael’s cartoons for the Vatican. However, although the tapestries were the intended final work for Raphael’s commissioners, though not completed until after the artist’s death, the cartoons are revered and preserved in the V&A, but Feio’s designs have not been exhibited, though probably Raphael’s were never seen until after the artist’s death, apart from to be checked off by the Vatican prior to weaving, and may not have been intended to be seen.